This is also posted in the original 3rd and 4th gear thread but it is easier to have it separated. 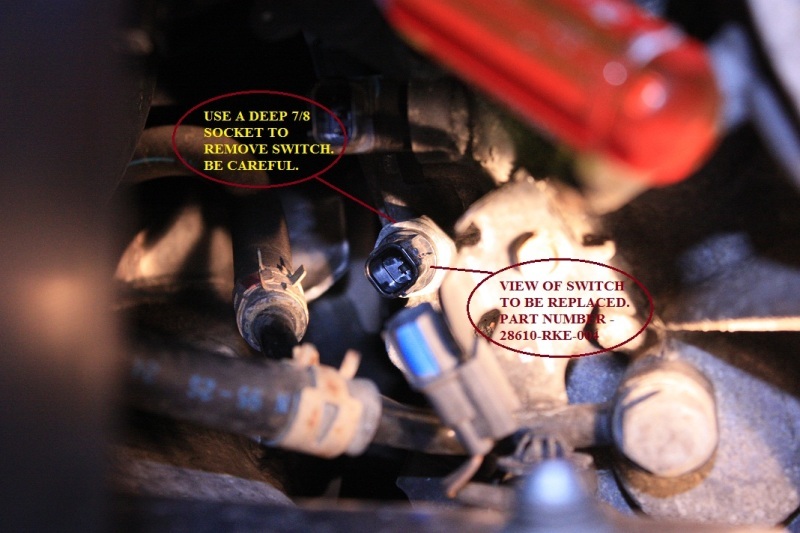 By now a lot of us have learned that the position of the switches in the 07-08 TL differ from the 04-06 TL. I used the information that was posted by JDM RICe. His pics are a lot better than mine so I stole some of them. Mods....if you disagree with having a separate thread, please feel free to delete this one. I have driven the car for about 12000 miles since I replaced the switches. I have also done a total of three 1x3 over a 15K mile stretch. The transmission shifts a lot cleaner than when I purchased the car. Parts were purchased from www.oemacuraparts.com. Floor Jack - DO NOT SUPPORT THE CAR WITH JUST THE FLOOR JACK. I started with the sensor on the bottom of the transmission. I accessed the sensor through the driver side wheel well. Remove tire. Please use jack stands for support. Once the cover was moved you will see a wire harness and a couple plugs. I unplugged the ones marked above and when you move the harness out of the way you will see the sensor. Be careful when removing the sensor. I used a deep 7/8 socket and a 16 inch extension. 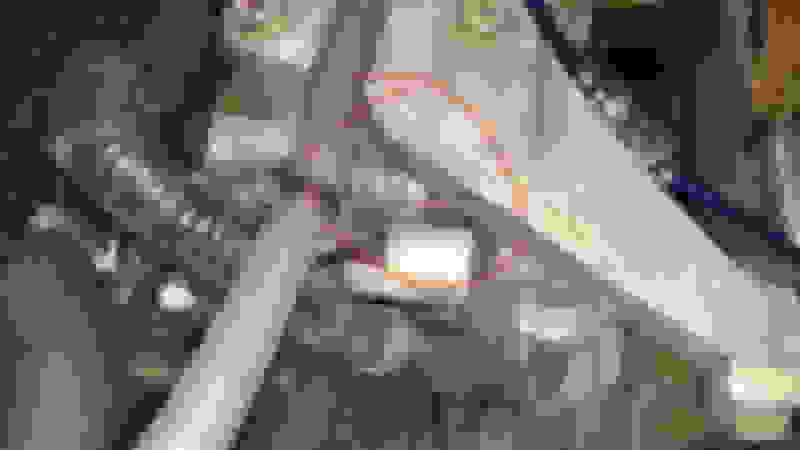 I did not need to use a breaker bar for this sensor. 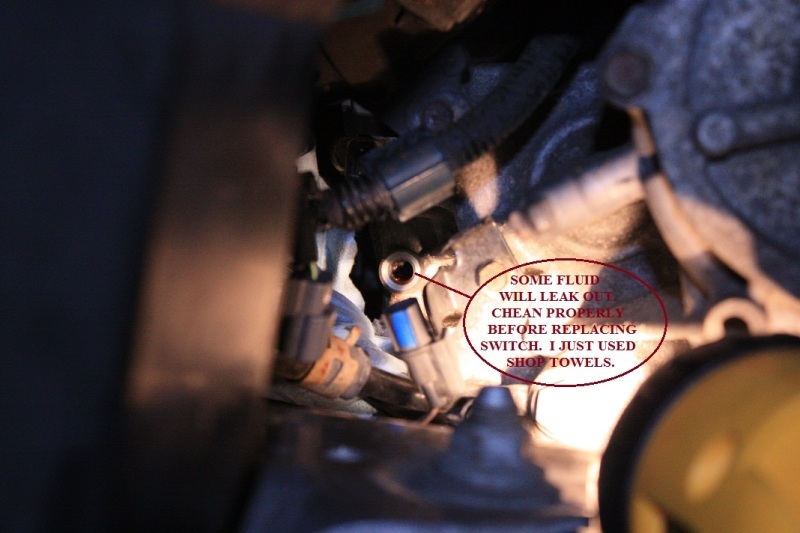 When you remove the sensor there will be some transmission fluid that leaks out. Wipe clean before replacing the sensor. DO NOT FORGET THE GASKET. 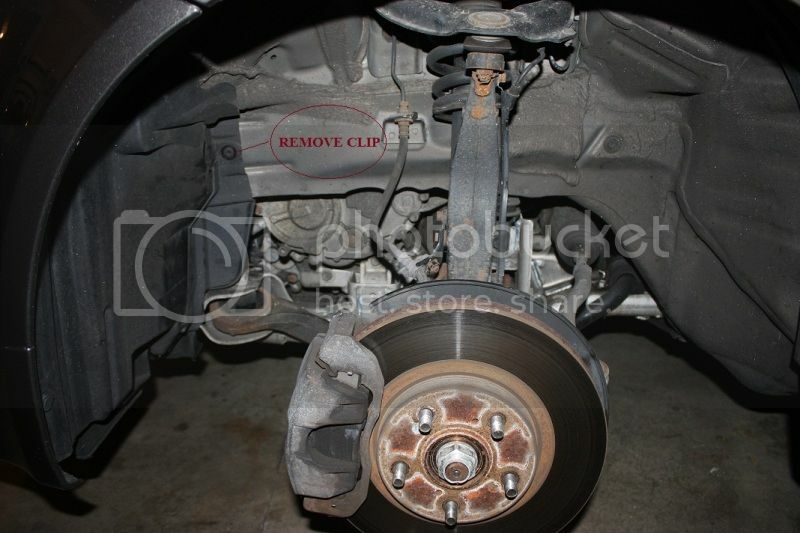 Plug everything back in and DOUBLE CHECK before mounting the wheel and lowering yourcar. Second one I did was the one under the intake. Removing the intake is simple. My pics sucked again. This one was very simple. I did not need to remove the 10 mm bolts above, but it will not hurt to remove them. Again I used a 7/8 deep socket and a 3 inch extension. I did use a breaker bar for this one. The last one I did was the sensor in the back of the transmission. I removed the hose in the image below to get a bit more room to get my hands down to the sensor. It is tough to see in the pics but that sensor is about 12 inches from the top of the engine. Overall it took me about 2 hours to replace the three sensors. I also did a 1x3 this weekend. I drove about 150 miles since I replaced the fluid and the sensors. The up and down shifting is a lot smoother than before. When I floor it the shifting is a lot cleaner. I have 2 long road trips this week and I will have a better chance to test it out. Sorry to reply on a old thread, planning on doing this, and I can't see which picture replaced the 3rd switch? 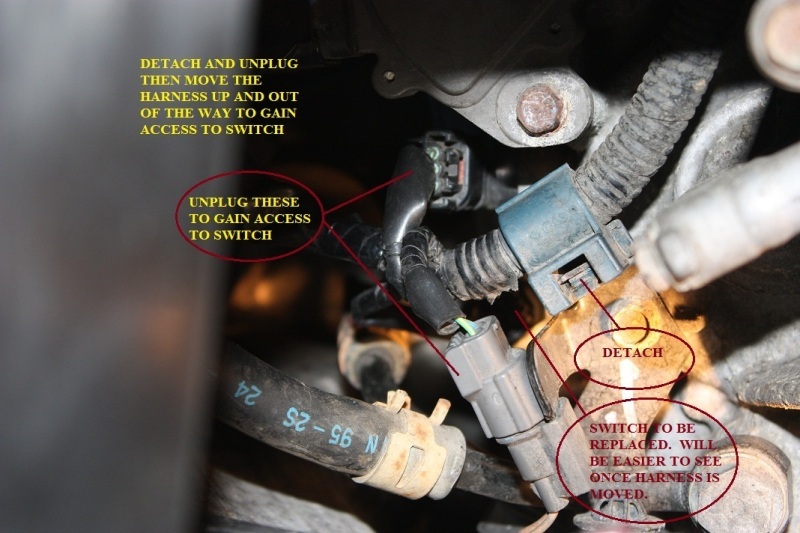 I only see pictures showing how to replace 2/3 switches, but everyone uses this DIY. Can someone please point out where the third one is, in the pictures? ^ I'm in the same boat. 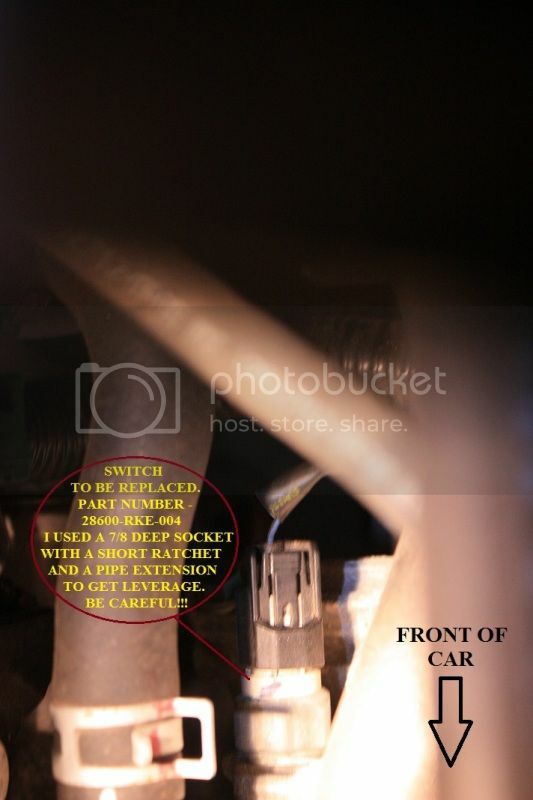 I see the images for the 1st and last one but not the one under the intake? 1 of the 2 switch with part # 28600-RKE-004. The switch is underneath that strut/bar thing (can you tell I'm a mechanic?). You have to look carefully, but you'll see it under there and it is barely accessible (unless you have some small, dainty hands). Did this pic come from a specific thread? If it did can you share the link? Just wondering if there's any tips on how to get to it? Yes - it came from Post #273 on this thread. Here is the link to that post. Good luck! Thanks alot! Just wondering where you ended up picking up your parts? Is this roughly what people are spending? I ordered them from acuraoemparts.com in June. It was $56.55 for each sensor and $2.57 for each gasket. That website also gives you a 5% discount for using "Acurazine" as a promo code (at least I think that was the code I used), so the parts were $174.44 after shipping. I should take this time to report that even after replacing the ATF with Redline Type-F fluids and swapping out the sensors there are still some clunky shifts. Driving a 2008 TL Type-S with almost 80k miles on it currently. One time, while coasting to a stop, one of the downshifts was so hard that it felt like I had hit something. That only happened once, but still sorta freaked me out. I've also noticed that between 2-3 the car tends to want to rev up to 4k RPM before shifting (even when I'm barely on the gas), but based on the responses on this site I believe this is normal behavior for the Type-S. I find it a bit annoying, but apparently that's just the way things are. I will continue to monitor my shifting, but otherwise loving the car. Thanks again! 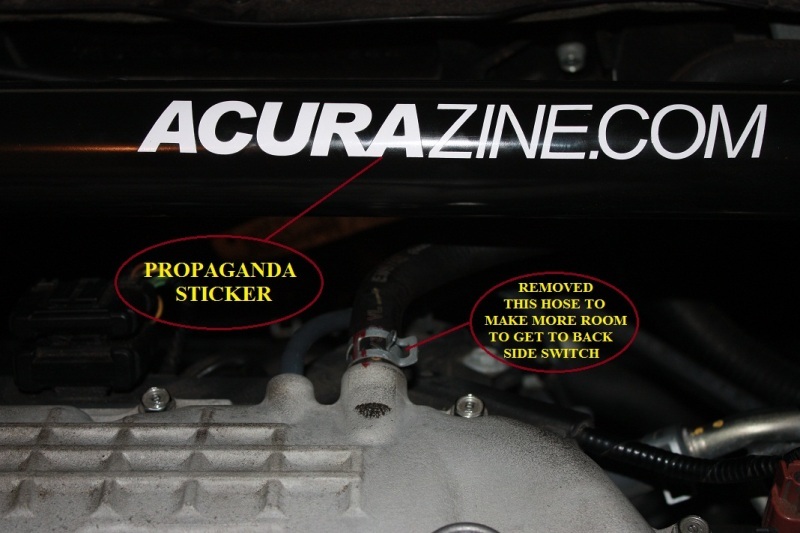 Just wondering if there's an equivalent of acuraoemparts.com here in canada? looking to purchase these switches in the next few weeks! Have you tried the ECM / Memory reset? I know a lot of folks don't believe in it, but every time I do it I notice a huge difference in shifting. I do it at least once a week. Does anyone know a place where I can get this done near in the NYC area? Thanks! or go onto yelp.com and find a mechanic. New to Forum . Thank you for all the info ! Can I use this info to work in my 07 TL??? Well the title says that this DIY is for 2007 through 2008 so as long as 07 falls in that range, I think you'll be safe. So i did this as a preventive maintenance and i must say i have not noticed much difference, other than a slight mental confidence placebo effect. I still have a slight kick between 2nd and 3rd that i was hoping to get rid of. From 3rd to 4th it's slightly smoother, but even then im not sure if its in my head. So overall, i would recommend it if you have extra money laying around, otherwise i would wait for a code to appear. Thanks for the good write-up!